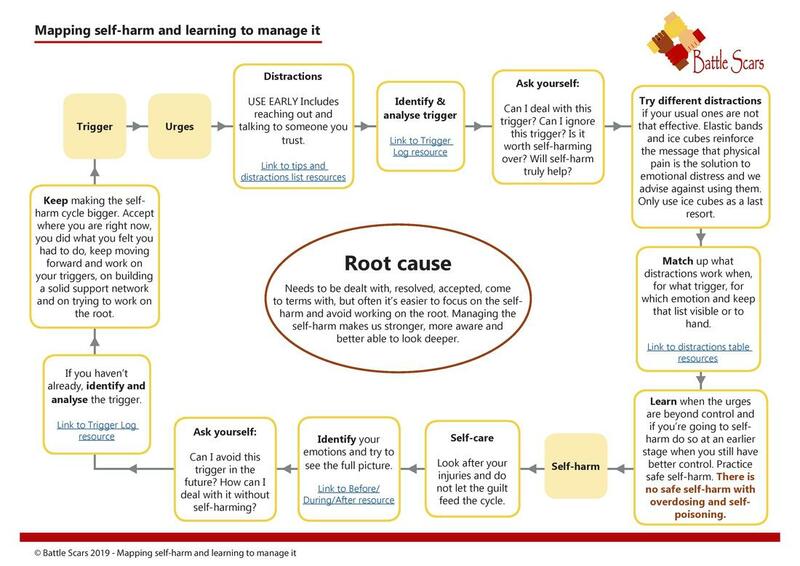 These resources could be of use whether you self-harm, care for someone who self-harms, work with people who self-harm or come across them through your work. A lot of these get constantly updated as our service users add their views and opinions. Some are downloadable as PDFs while others have extra worksheets that might be helpful. Please check out our new video on the myths and realities about Borderline Personality Disorder below. For organisations, schools, private companies etc. As put together by our service users. You can also request our A5 leaflet, the 'I Need To Tell You...' leaflet and our crisis card by using our leaflet request form. I would like to thank Battle Scars for their work in collating some feedback from service users and carers on their experience of our service. Jenny Groves (Battle Scars CEO) was invited and attended our CAS clinical improvement forum to feedback the report so we can share it with the team. The Crisis assessment service provides telephone and face to face assessments for approximately 500 service users and carers a month and do receive a lot of positive verbal feedback on our support and interventions. However we recognise that we don’t always get this right so any opportunity provided that enables us to reflect on our input is always welcome. I note that a lot of areas covered in the suggestions section on what people find helpful are similar to the “I Statements” produced by Leeds Involving people in their “Together we can” report which we have promoted within the team. As your report highlights self reporting of what constitutes a mental health crisis can be wide ranging and differs from one person to another. We recognise that what we may offer at this time when someone is making contact with us may not always be what they expect or find helpful but we try to provide support based on what that person is telling us. As a service we do have a strong ethos of providing a response with an emphasis on care and compassion that can help the service user create their own solution to whatever has contributed to the crisis. We welcome the introduction of a new crisis card as we recognise that a robust process of support and safety planning can help our team guide the service user to a more helpful response. As part of the implementation of the Trust community redesign scheduled for March 2019 this will provide an opportunity to relaunch the Trust single point of access in terms of the remit of this option compared to other services available in the city who can also offer mental health crisis support.